According to an old Chinese Saying, “If you want to be happy for a short time, get drunk; happy for a long time, fall in love; happy forever, take up gardening.” That’s it. My blog is done for the day. What else were you looking for? Each weekday morning, that is my goal – to inspire the least of the inspired gardeners. I guess I like fixer-uppers. Add a little elbow grease, well-honed tools and helpful hints and out of nowhere, a gardener appears; the next happy Joe digging in the dirt. With that said, just because it’s November, I’m game to find inspiration in my own garden to keep you cheerful and focused on the best therapy available – gardening. Today I won’t give you nitty-gritty details – I’ll just share easy ways to find garden happiness even in November. Plant grasses. Not the green stuff that requires mowing. 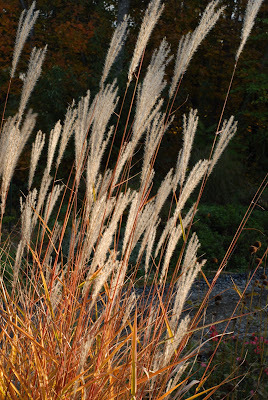 I’m talking about the tall, elongated ornamental grasses that sway and dance in the November air. 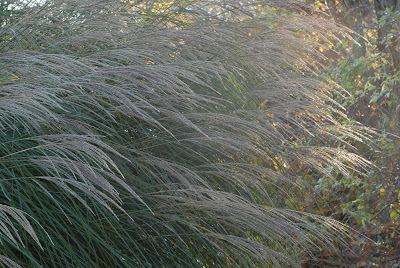 Great for any location, tough and durable, grasses are easy to plant and maintain for even the novice. No excuses. 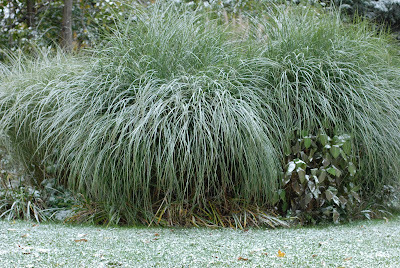 Even in the winter months, ornamental grass is that one plant that keeps on giving.